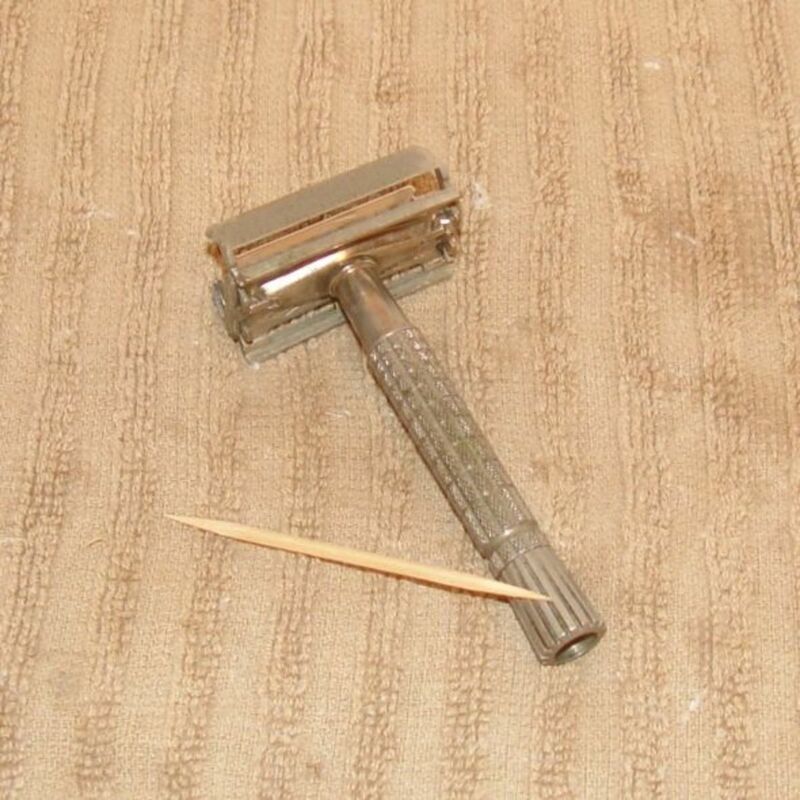 Today we're going to show you how to clean vintage double edge razors. 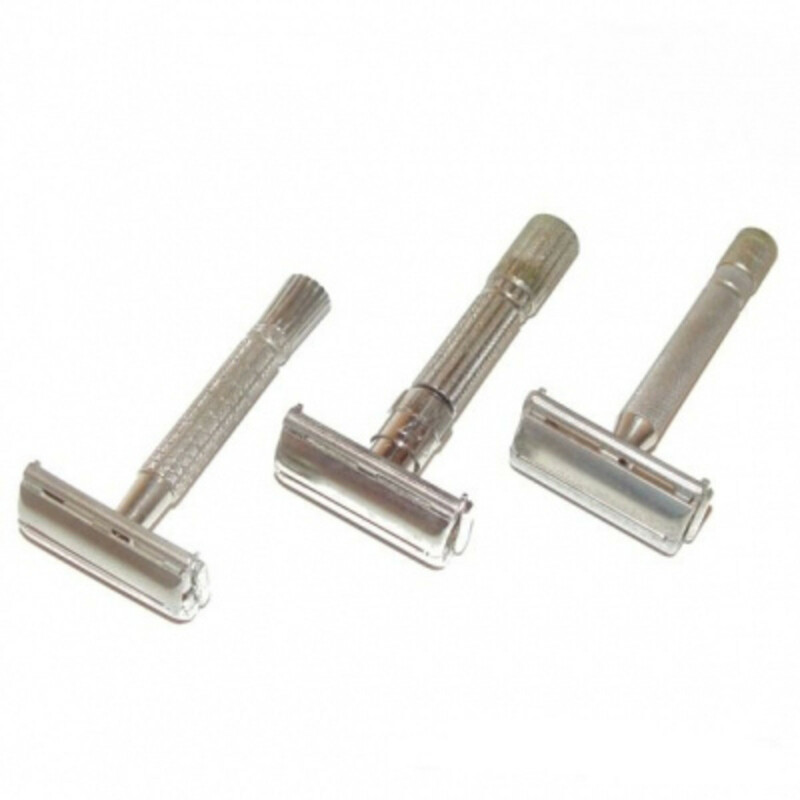 We'll use a Gillette "Fatboy" Adjustable safety razor, a Flare Tip, and a Super Speed as examples - and see what we can find underneath. We'll use all sort of methods to strip away the grime. 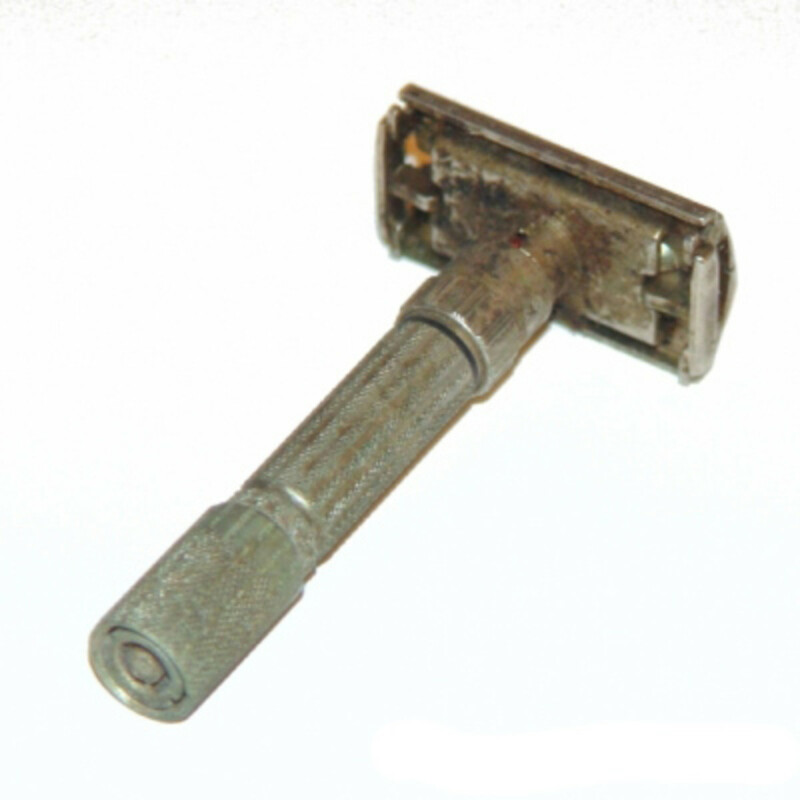 When you buy vintage Gillette double edge safety razors at flea markets or garage sales, they are often so coated with decades of grime, corrosion, soap scum, and lime, that you can't tell what you'll have when the razor is clean. It's always exciting to find what sort of treasure you have! 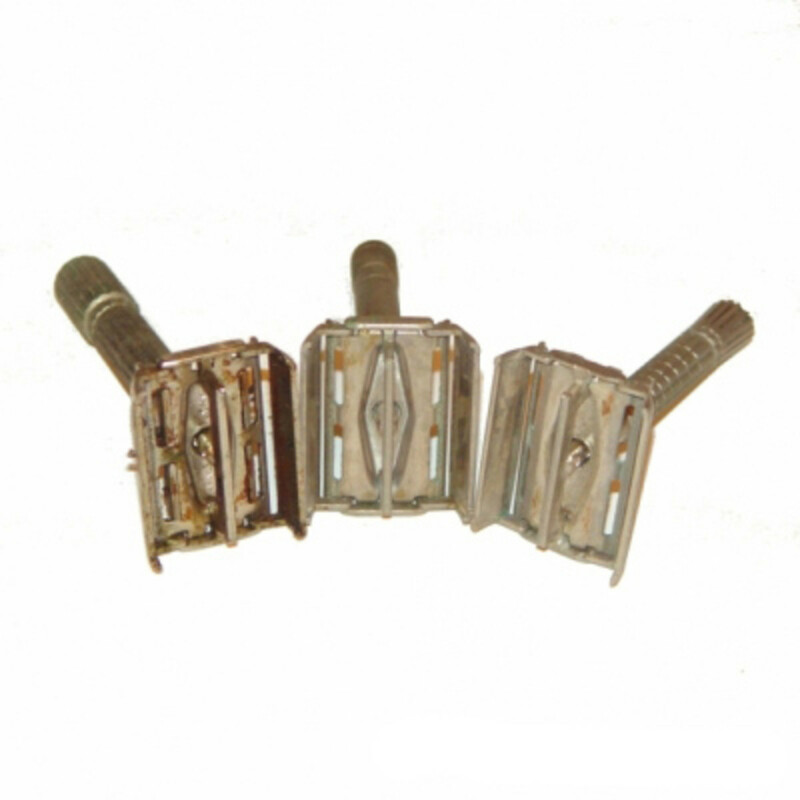 Classic Gillette double edge ("DE") safety razors were manufactured in the first part of the 20th Century. They were made in US, England, and Canada. 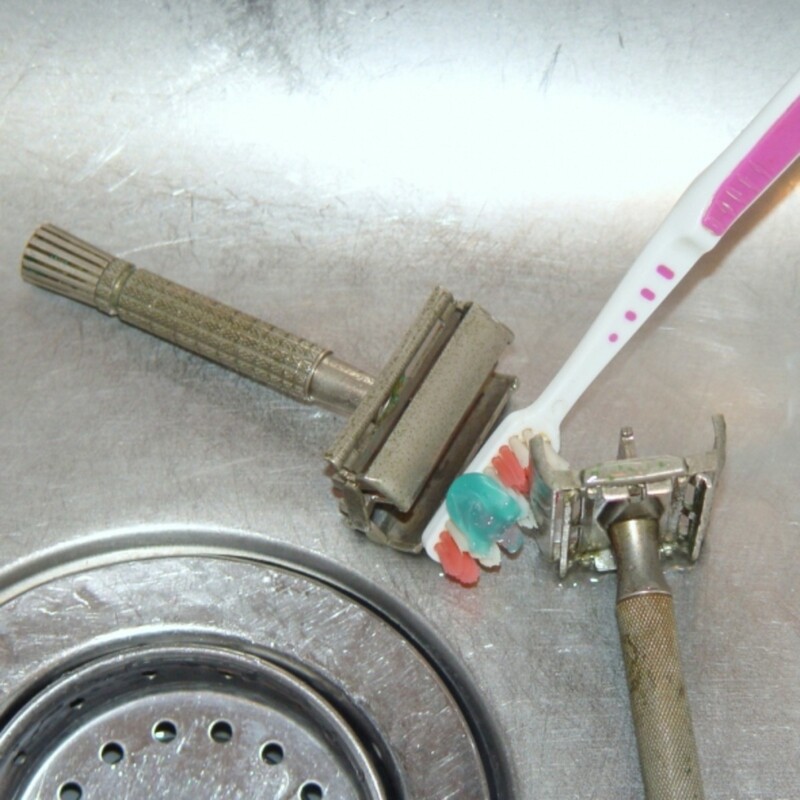 These cleaning methods also work on single edge safety razors, and on non-Gillette DE razors. 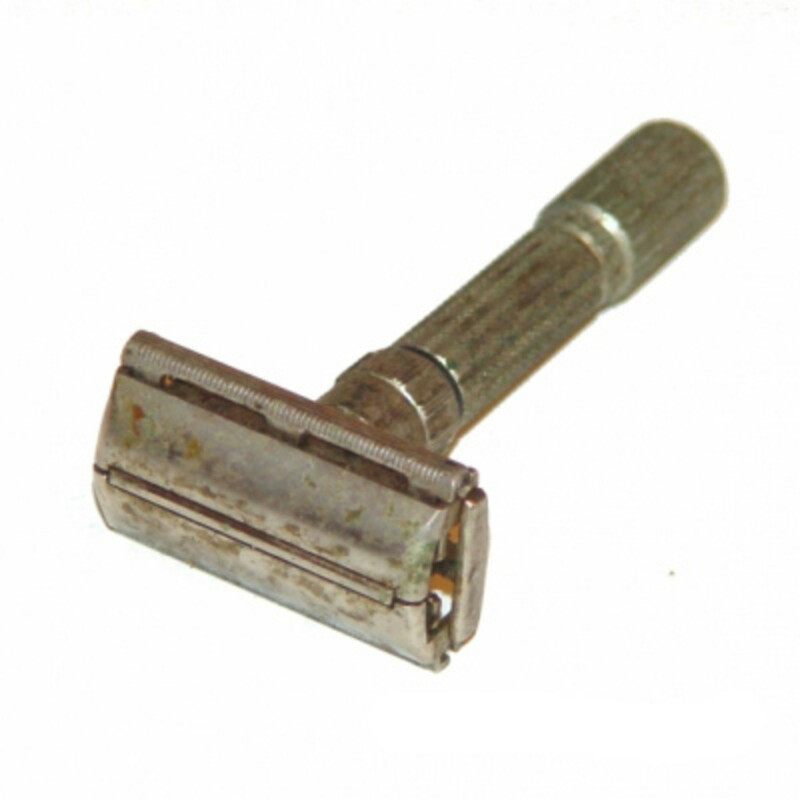 Many of these instructions are for cleaning vintage steel and nickel-plated razors. 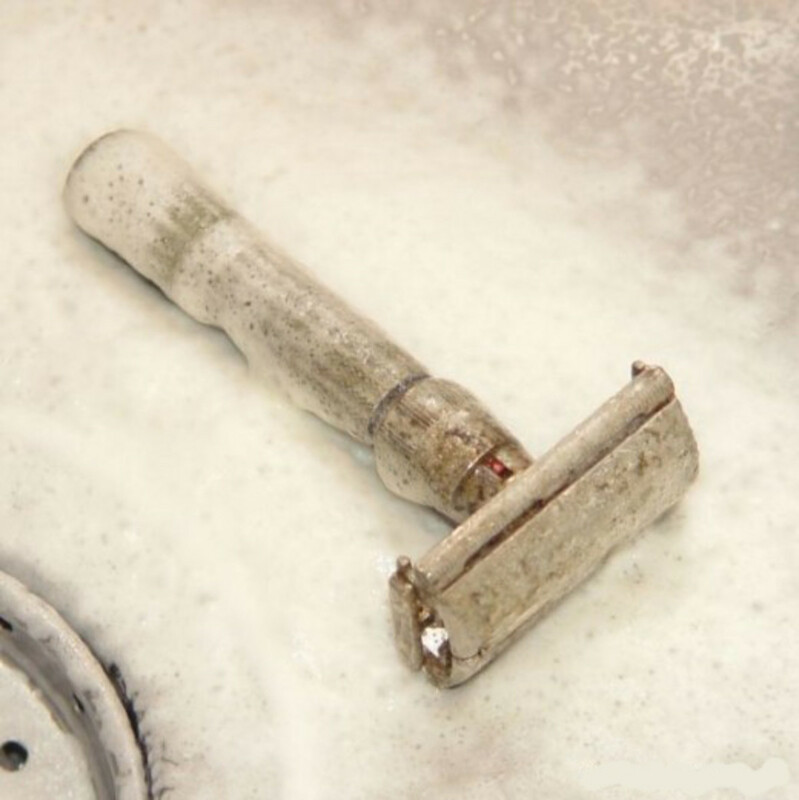 Cleaning chemicals can damage plastic, painted, brass-plated, or precious metal-plated razors. See notes under various cleaning methods for details. 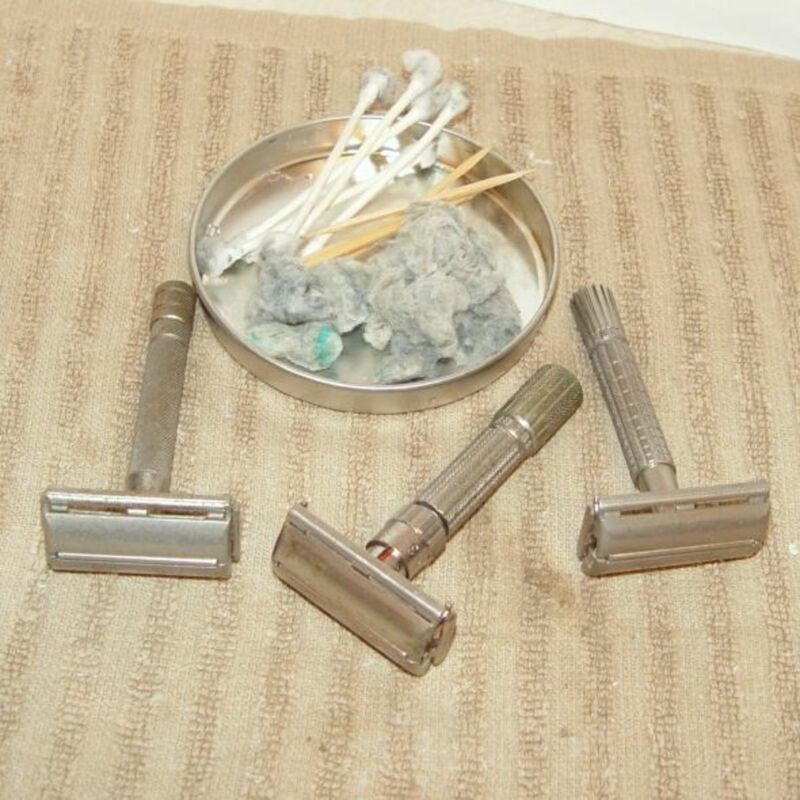 These are the basic tools we use to clean shaving razors. 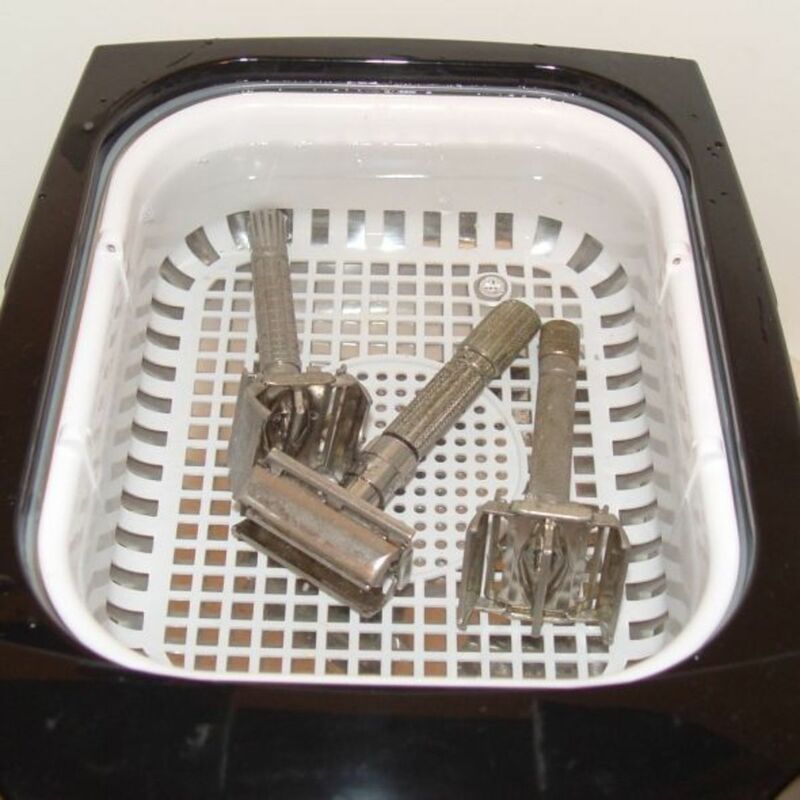 If the razor is only a little dirty, we go straight to the ultrasonic cleaner. 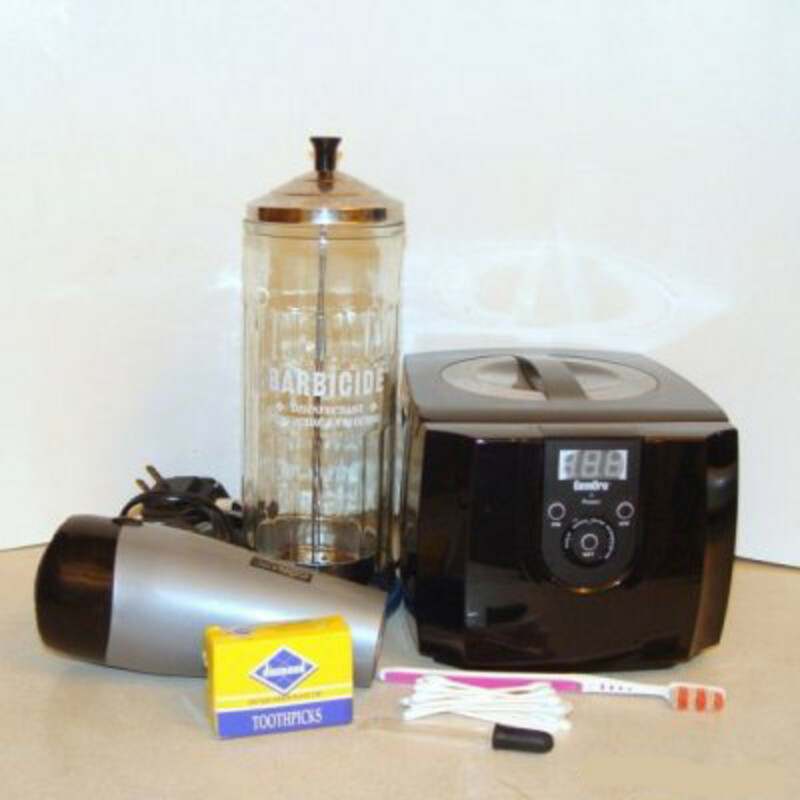 Our little GemOro Ultrasonic Cleaner has lasted well for almost a year. It sits conveniently at the back of the counter and holds several Gillette shavers at once. 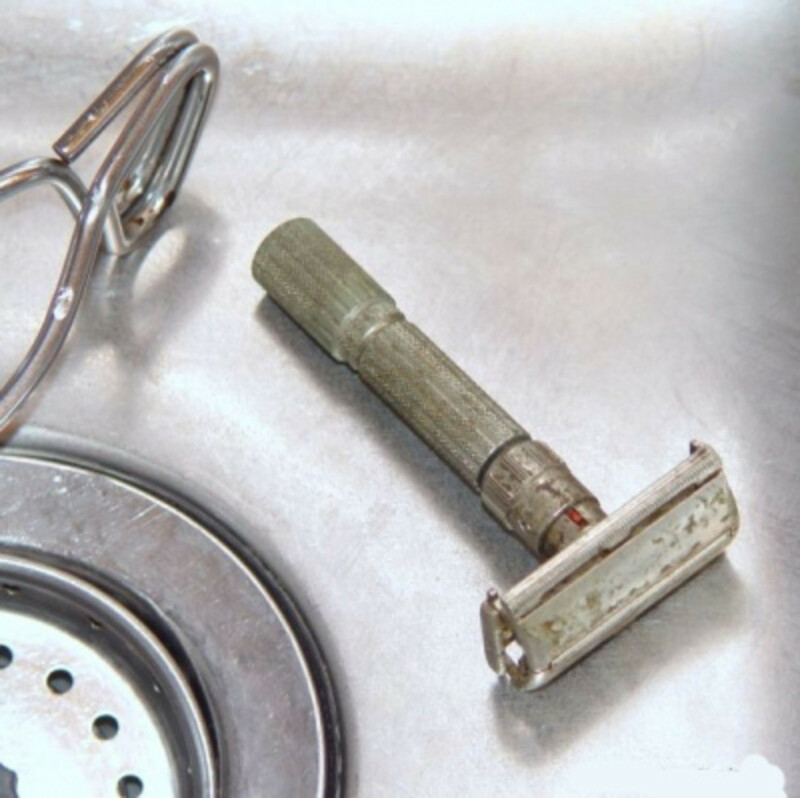 No matter how clean a razor looks going in, the water will be grey or brown with dirt when it's finished! The only downside is that the timer only goes to 480 seconds, so you may need to start it over a few times. We use tap water with dish detergent or vinegar, but you can also buy a concentrated cleaning solution. We rarely use all these on one razor - just what's needed! There are notes on each step about what each chemical is appropriate for. The Gillette Fatboy is so coated with greasy dirt that we're going to start out by scrubbing it with oven cleaner (you can also use foaming bathroom cleaner). 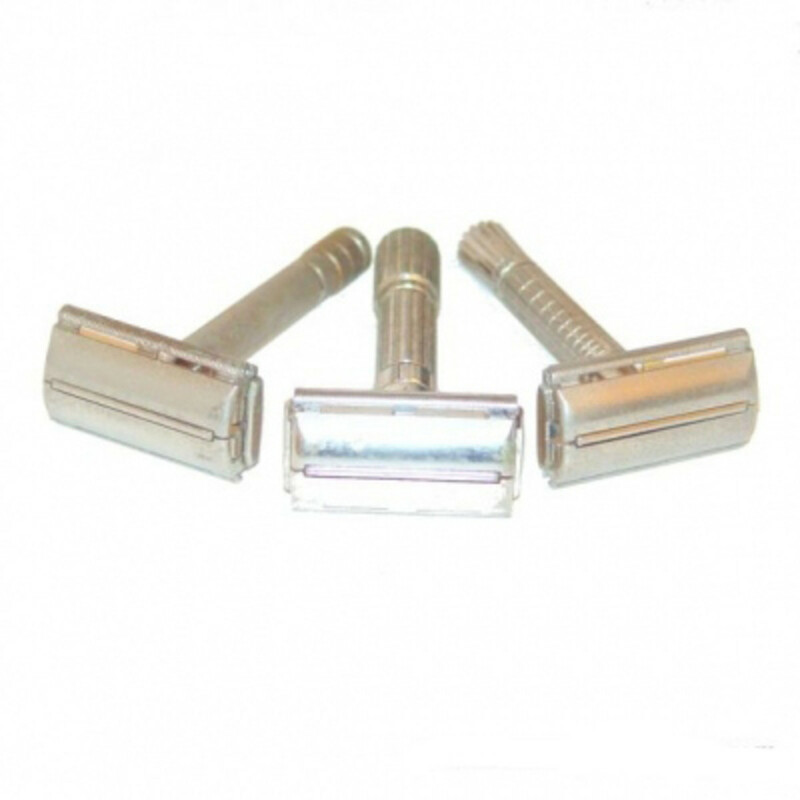 Note: Oven cleaner and foaming bathroom cleaner are both very strong, so we only use them on very dirty steel or nickel-plated razors. 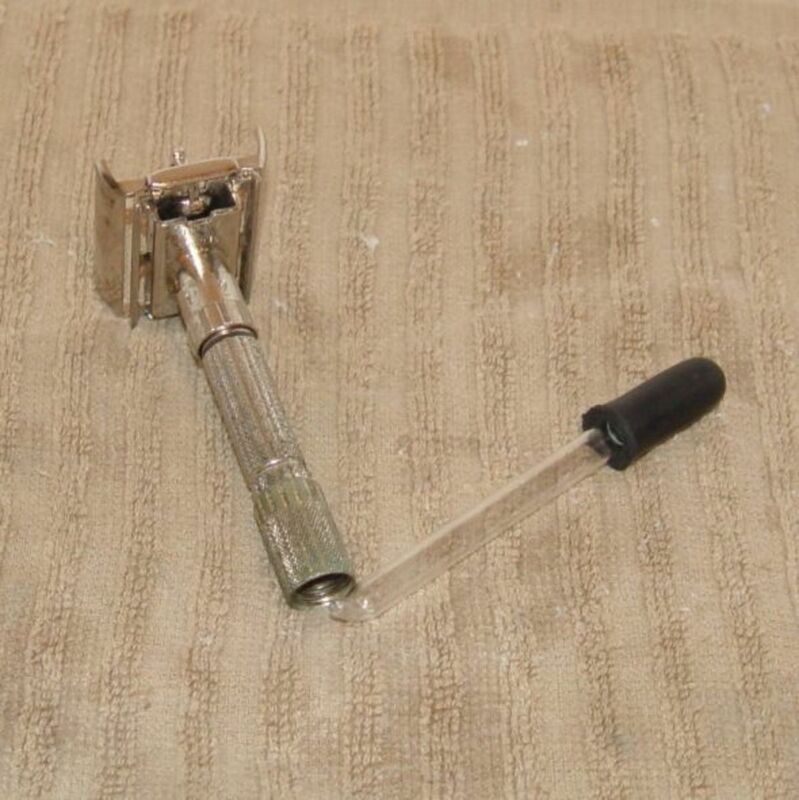 If the razor has a painted handle or tip, be sure to keep it covered as the chemicals will remove the paint. 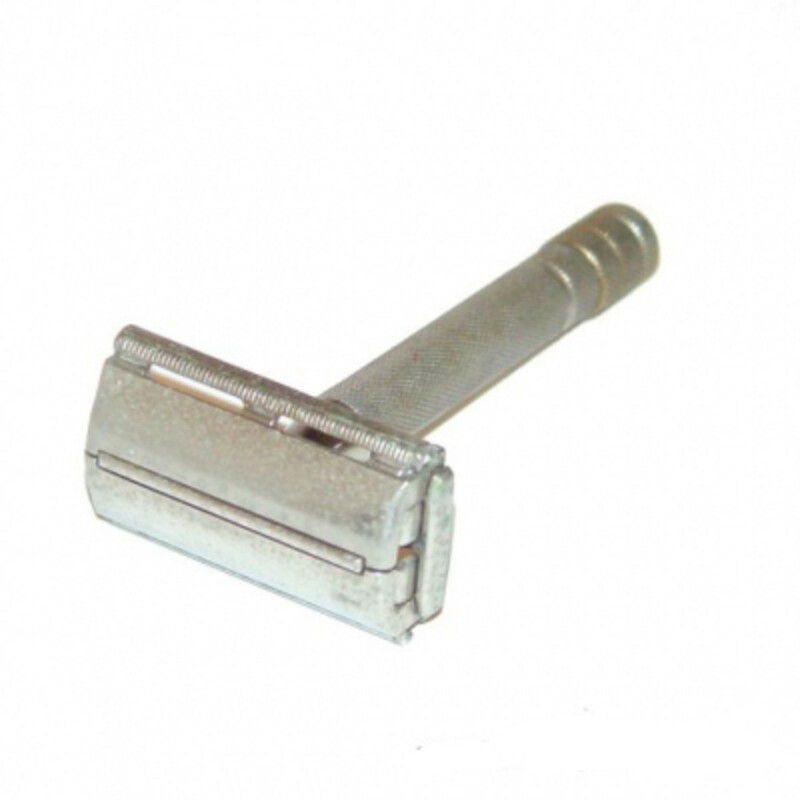 This will damage plastic or brass-plated razors. Let soak for 3 minutes, then scrub with a toothbrush. Get into the corners inside and underneath the head, and into the base of the handle. The Flare Tip and Super Speed double edged razors have less build-up, so we're starting them with a hydrogen peroxide dip. 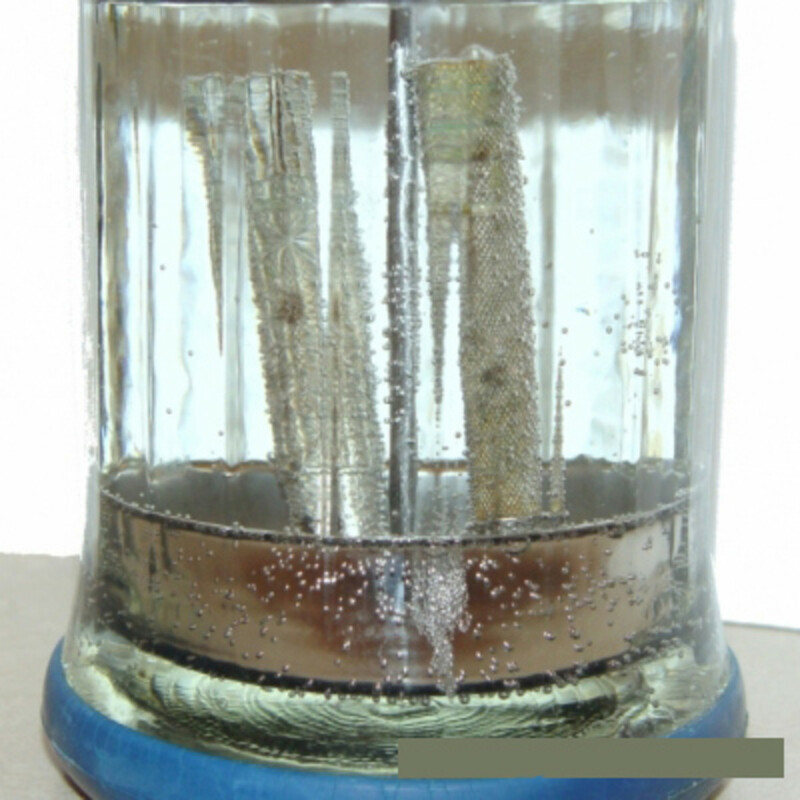 You can do this in a glass jar (we're using a Barbicide disinfector, as it's easy to lift the razors in and out). 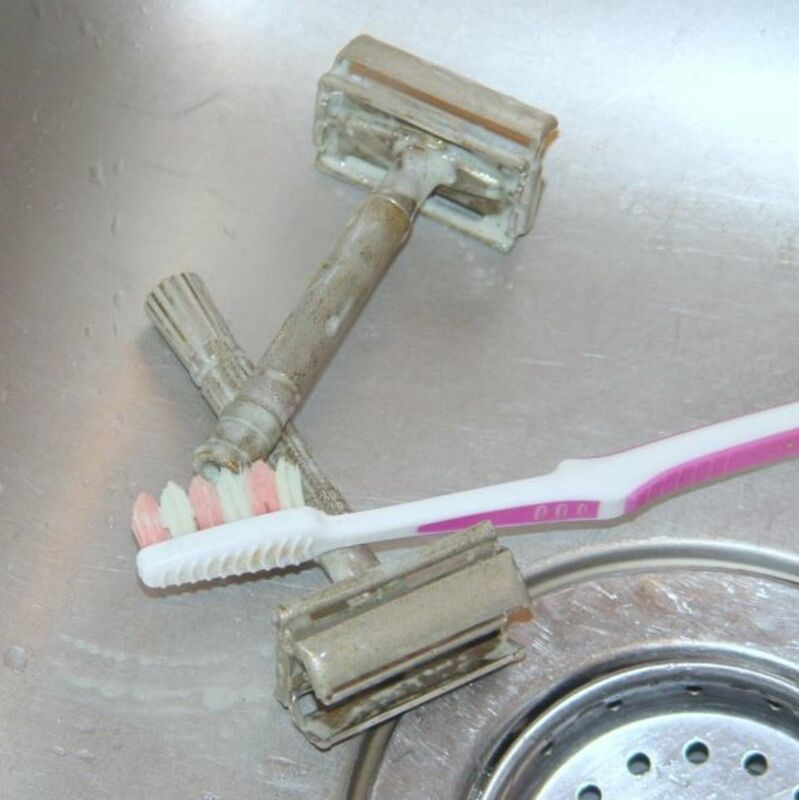 Pour enough peroxide to cover the razors, and lower them in. Let them sit for at least two hours - you'll see a bubbly foam on them. If it's thick, rinse it off and put the razors back in. 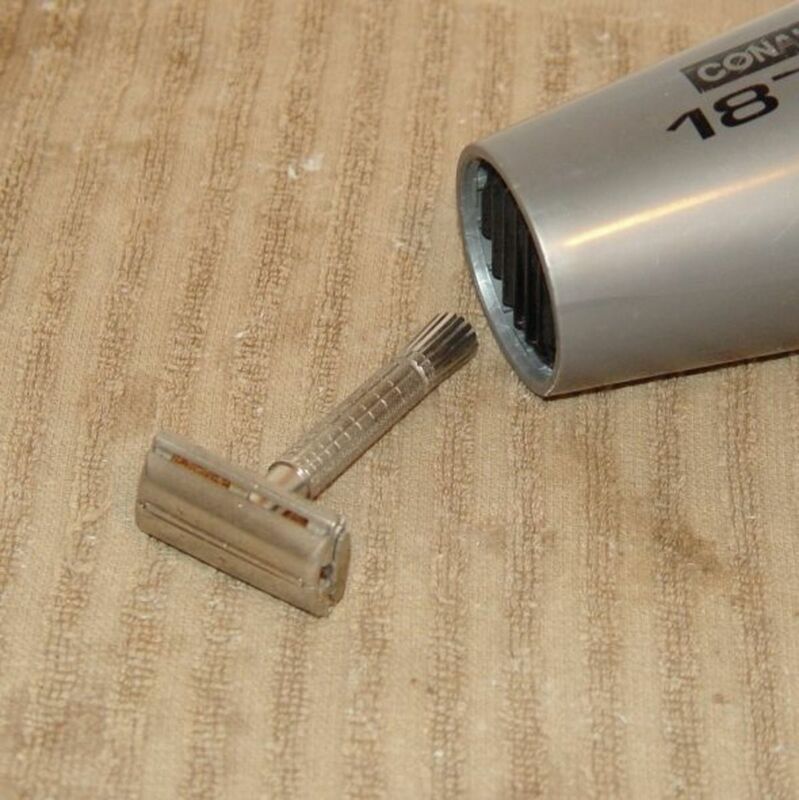 When you take the razors out, rinse them thoroughly. Note: Hydrogen peroxide will lift the paint off of painted handles, like the Gillette red-tip and blue-tip, and some black handles. If you need to clean the head, make sure the handle is out of the peroxide. 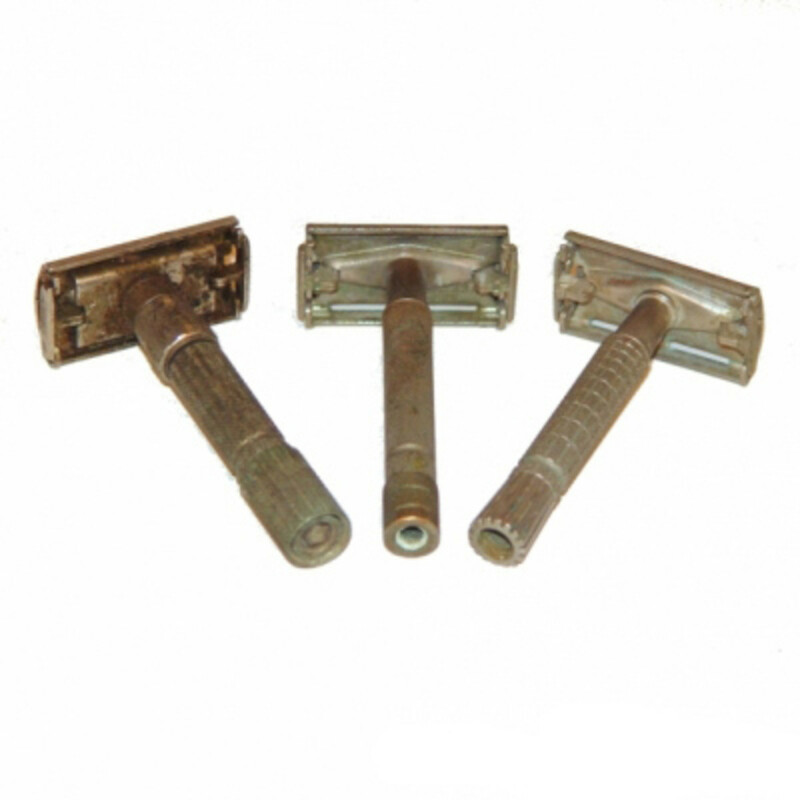 Peroxide may discolor brass-plated razors. 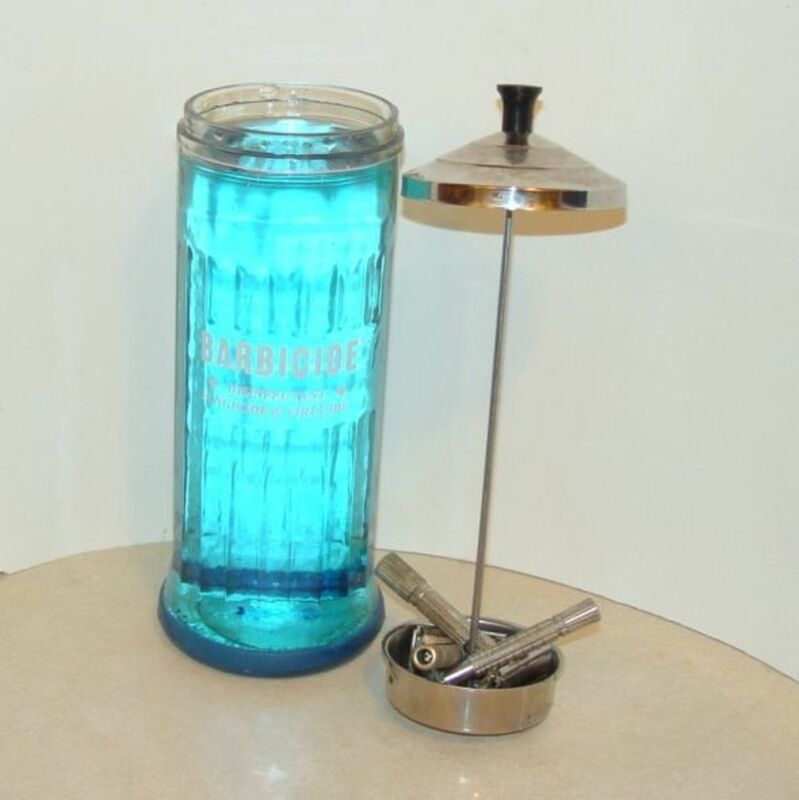 The Barbicide Disinfectant Jar has a stainless steel basket to add and remove your razors from Barbicide disinfectant. 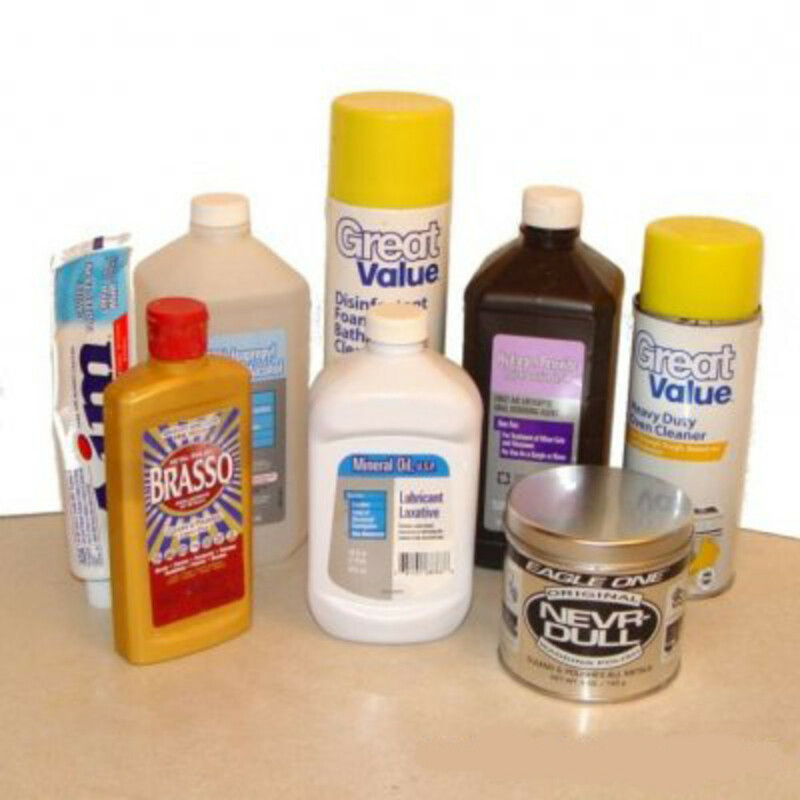 We also use a Barbicide jar for Evapo-Rust, alcohol or hydrogen peroxide. It eliminates splashing, and keeps you from having to touch the liquid. 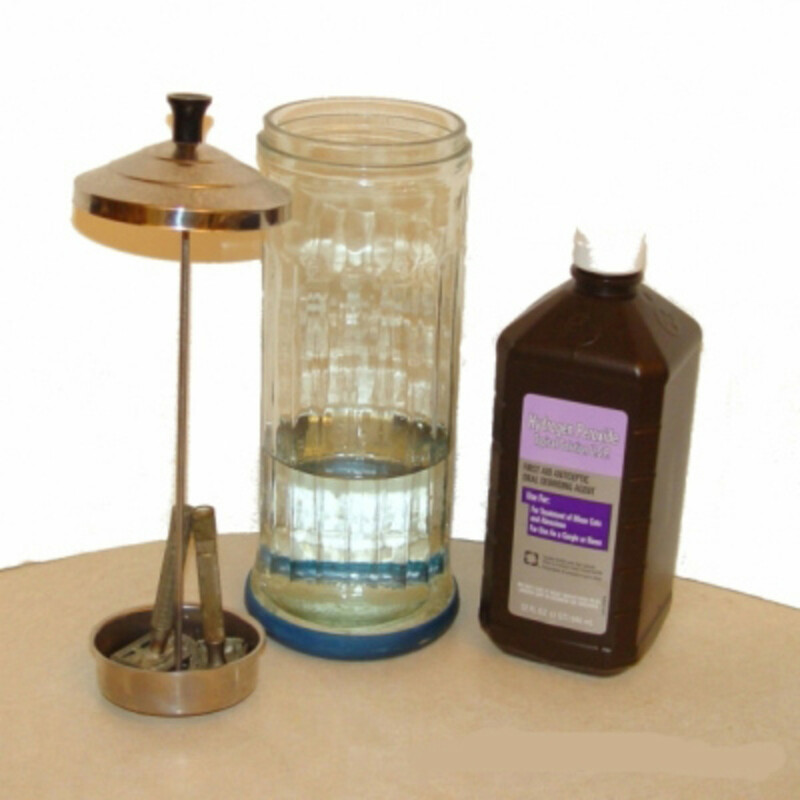 You can purchase Barbicide disinfectant to use with your jar. 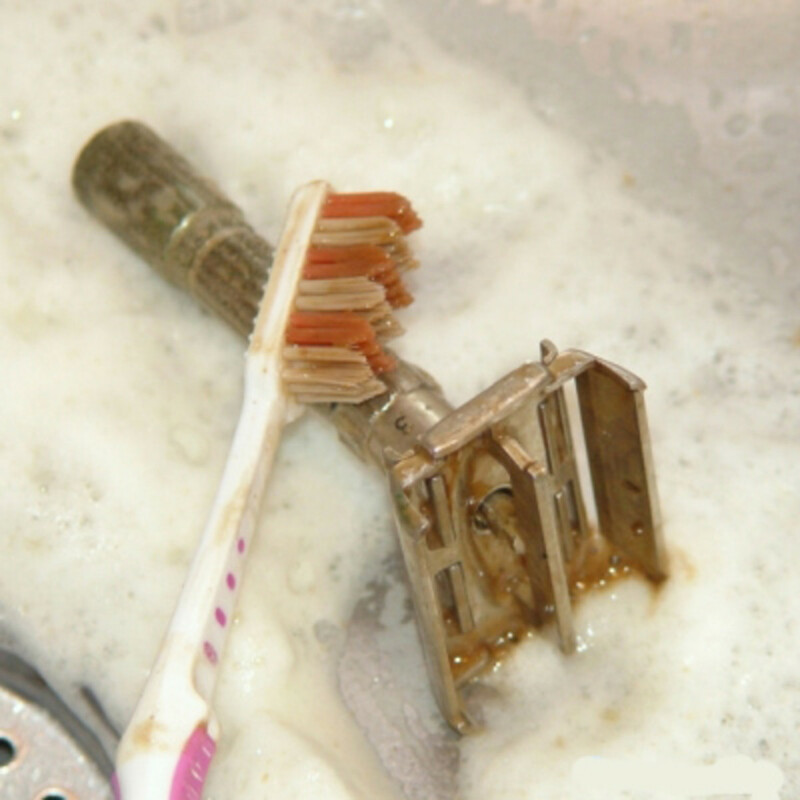 Now that the grime is loosened, put the DE razors back in the sink and scrub with an old toothbrush and toothpaste. 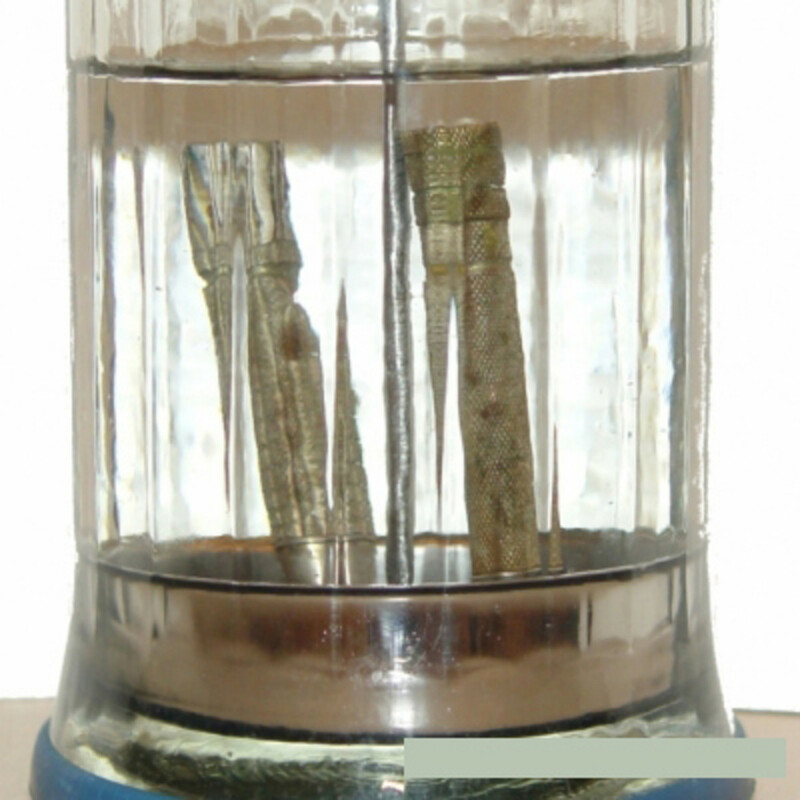 Use toothpicks to get dirt out of the grooves, and be sure to scrub inside the base of the handle. 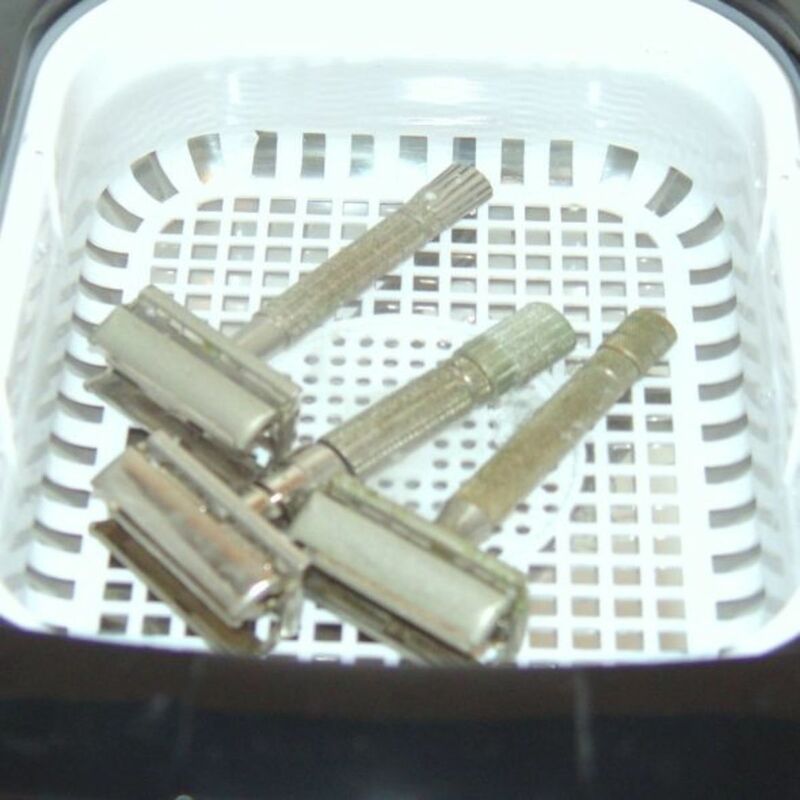 If you have a delicate razor - plastic, bakelite, or brass-finished - always skip the chemicals and go straight to the ultrasonic cleaner. 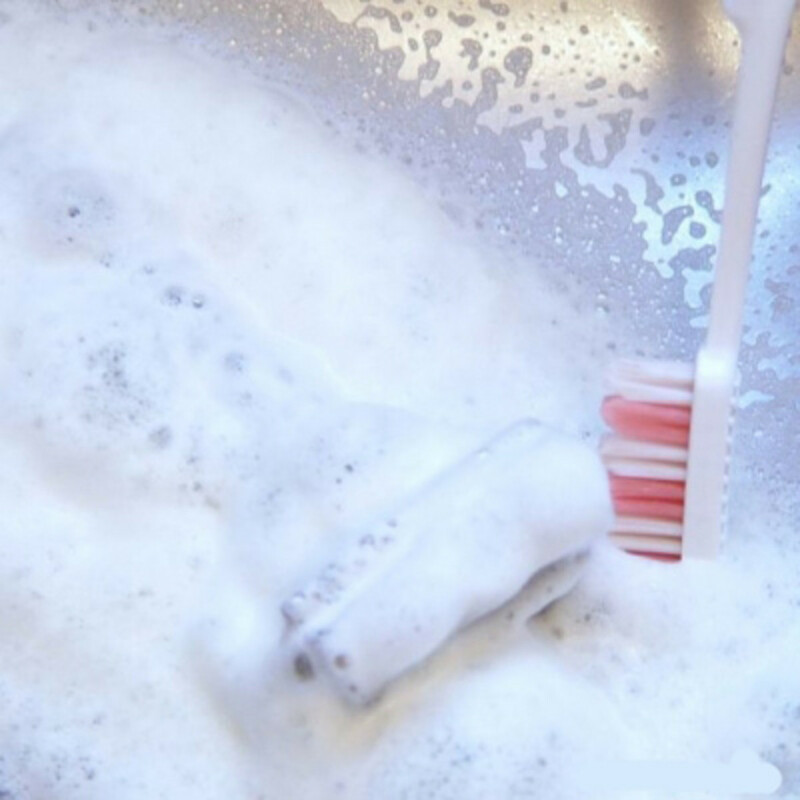 You can use either cleaning concentrate or water with a little dish detergent ( and perhaps a bit of vinegar if the razors have a whitish deposit that won't come off). Put the razors in the water and set the timer to 30 minutes. If it won't go that high, you may need to reset it several times. 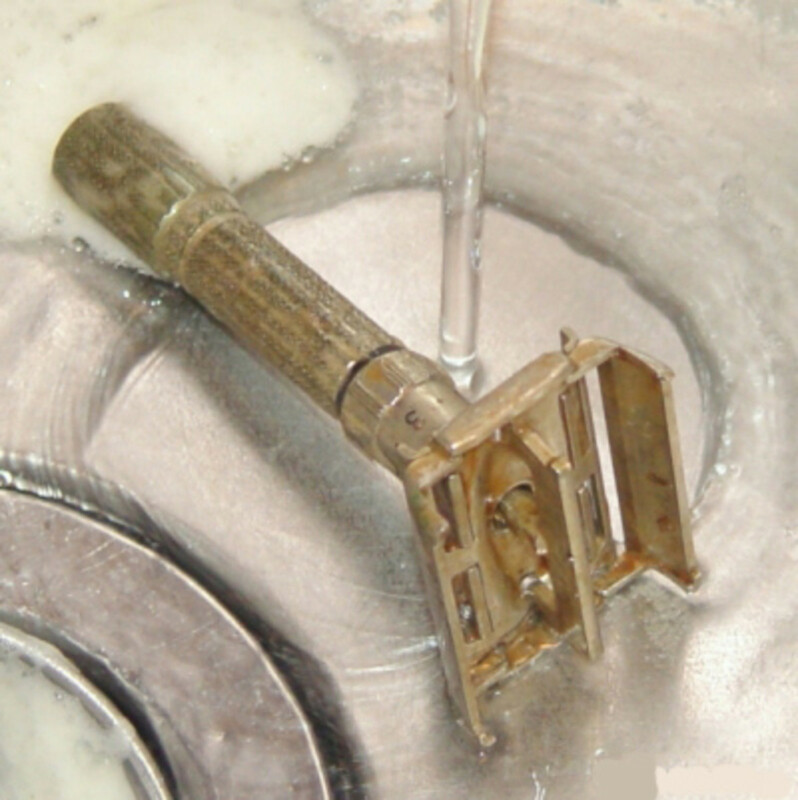 Even though the razors have been through a lot of scrubbing, when the ultrasonic cycle is over, the water is usually dark with removed dirt. 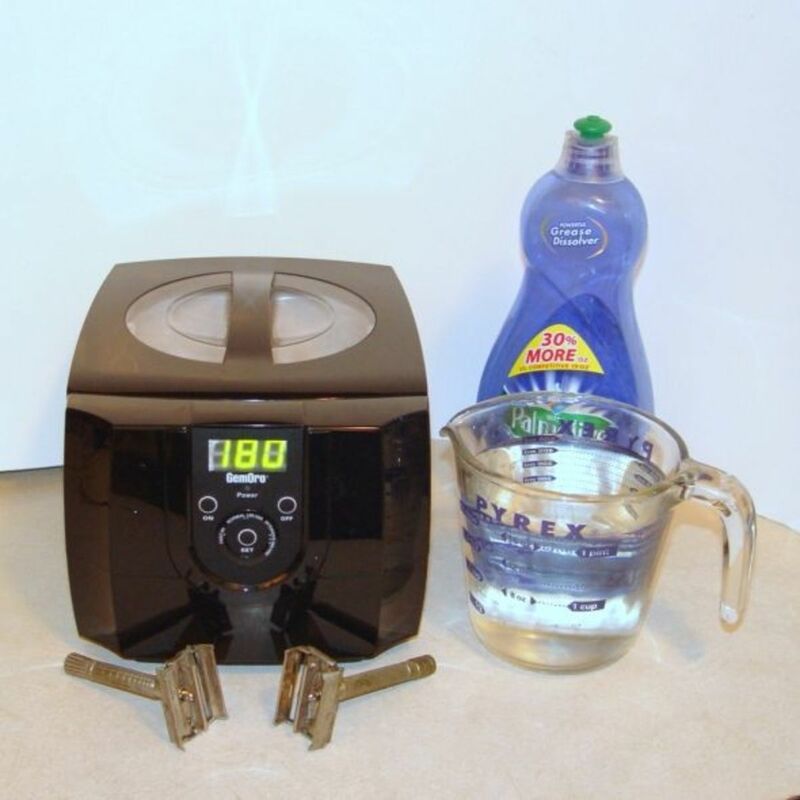 If you don't have an ultrasonic cleaner, you can boil the razors in water with dish detergent or vinegar. 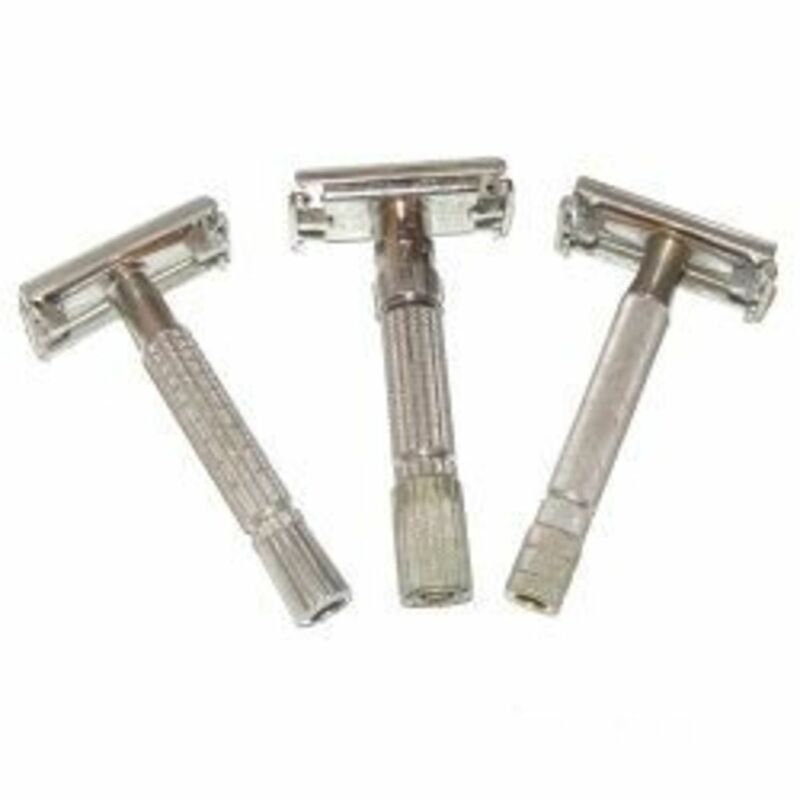 Treat razors plated in precious metals--silver, gold, rhodium, platinum--like jewelry. Don't use harsh chemicals or rough scrubbing. Use jewelry cleaning solutions, cloths, and brushes to preserve the finish. This jewelry dip is safe for all metals. Includes a buffing paste to remove scratches - be careful with thin plated precious metals. You can use a liquid metal polish, like Brasso, or Nevr-Dull, which comes in cotton wadding. 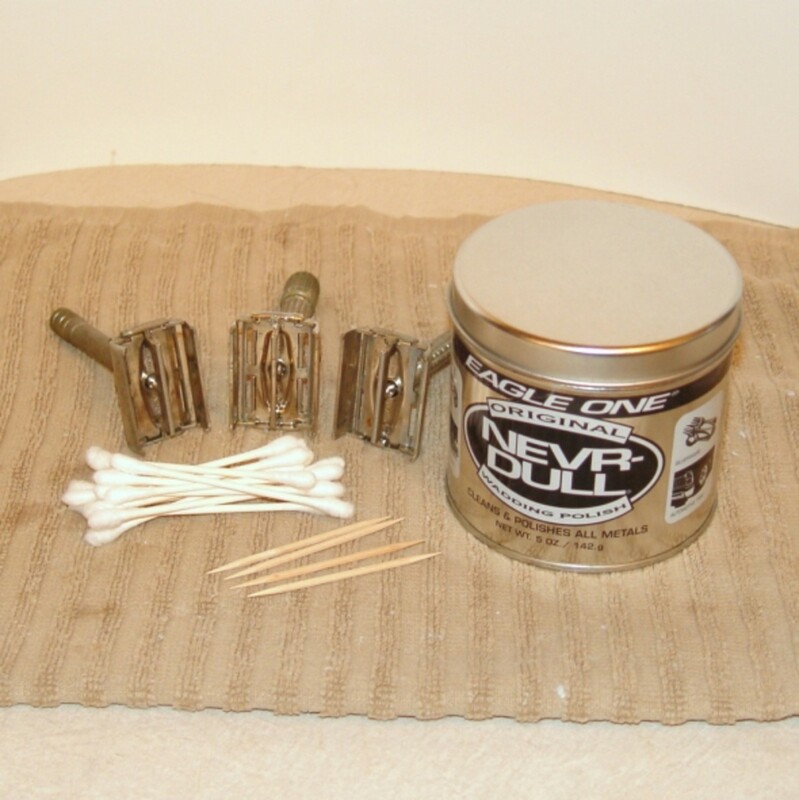 Apply polish to the razors - if using Nevr-Dull, buff with the wadding. 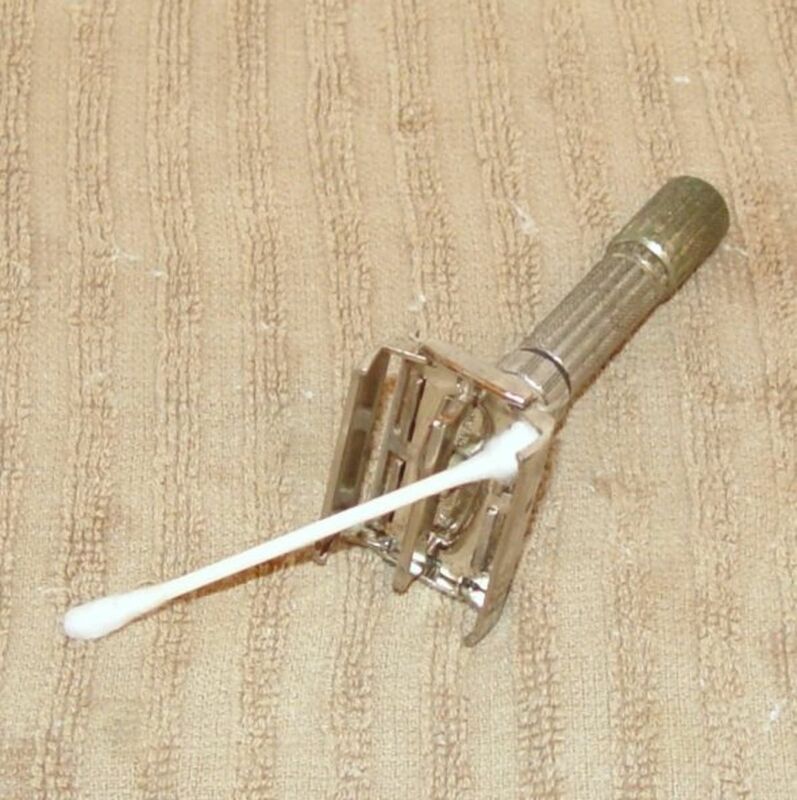 Use cotton swabs to buff inside the head and underneath, getting into all the corners. You can use toothpicks to work wisps of wadding into small crevices. Note: In spite of its name, Brasso can damage brass. Only use it on steel razors. The Fatboy adjustable razor had a couple of rust spots on its head, so we put it in Evapo-Rust. The rust disappeared within a couple of hours! Evapo-Rust is not caustic - you can remove the items with your bare hands. 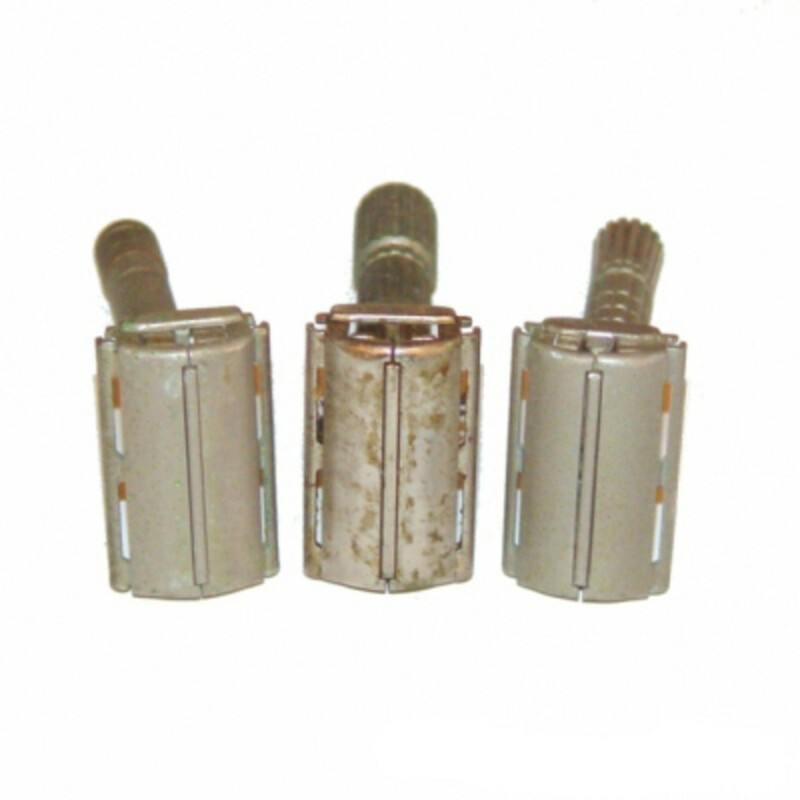 It has very little odor, especially compared to caustic rust removers. Soft cotton wadding permeated with metal polish. Easy to use, it polishes metal to a gleaming shine without scratching. 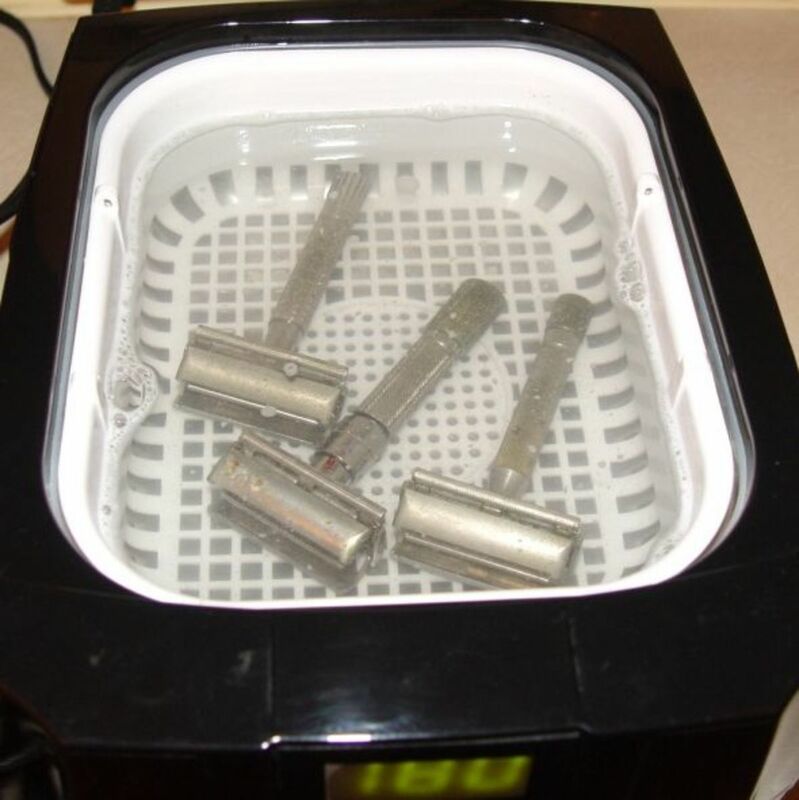 Run the razors through the ultrasonic cleaner again for a few minutes - metal polish residue on a razor can sting your skin. Soak them in a disinfectant, either Barbicide or rubbing alcohol. Use a dropper to put a couple of drops of mineral oil into the end of the handle, and the hole on the inside, under the center bar. 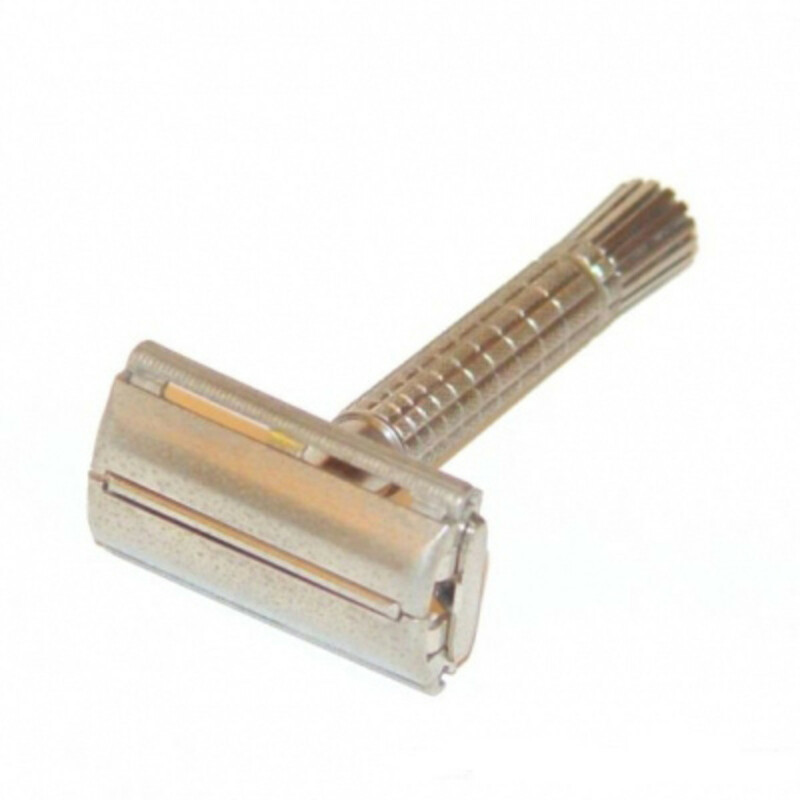 Open and close the razor several times, then wipe the excess off. 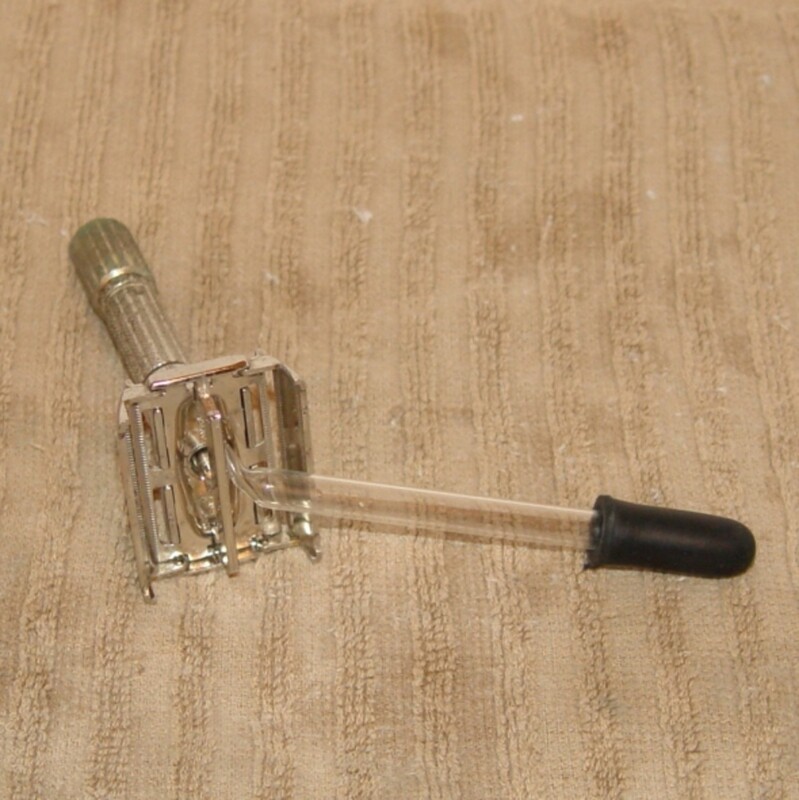 Use a blow dryer on lowest setting to dry the inside of the head and inside the handle, so it won't start rusting. 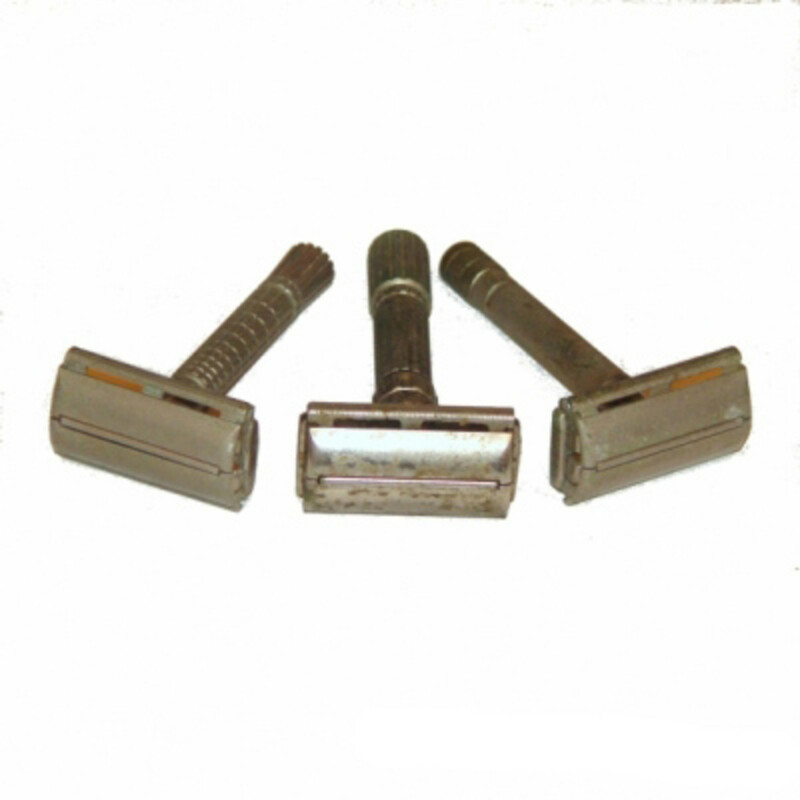 See the Clean Safety Razors! Here they are at last, cleaned down to the shine. 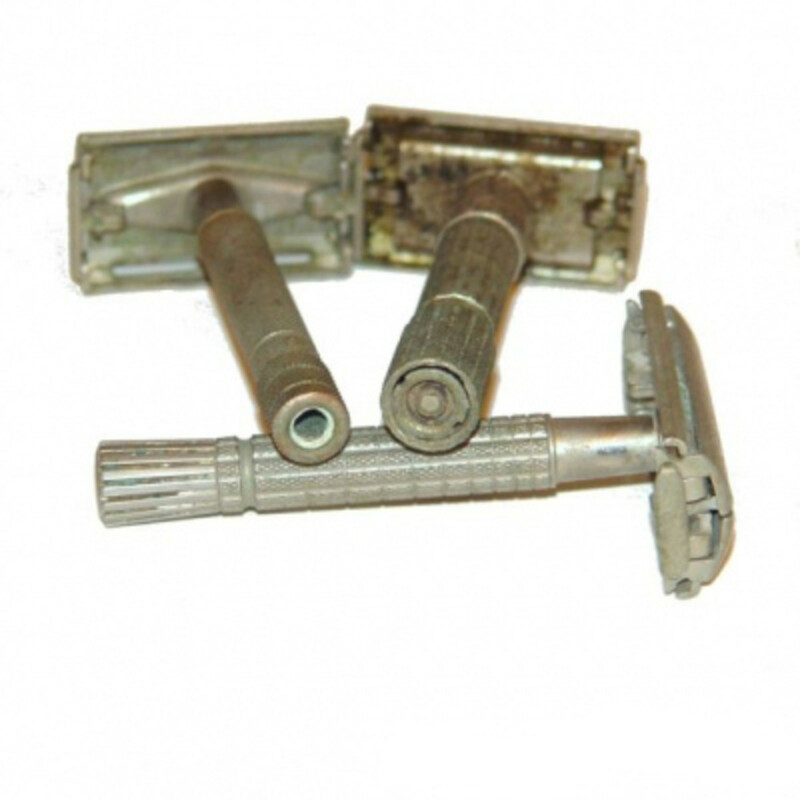 These turned out not to be perfect razors - they all have blemishes and noticeable wear. 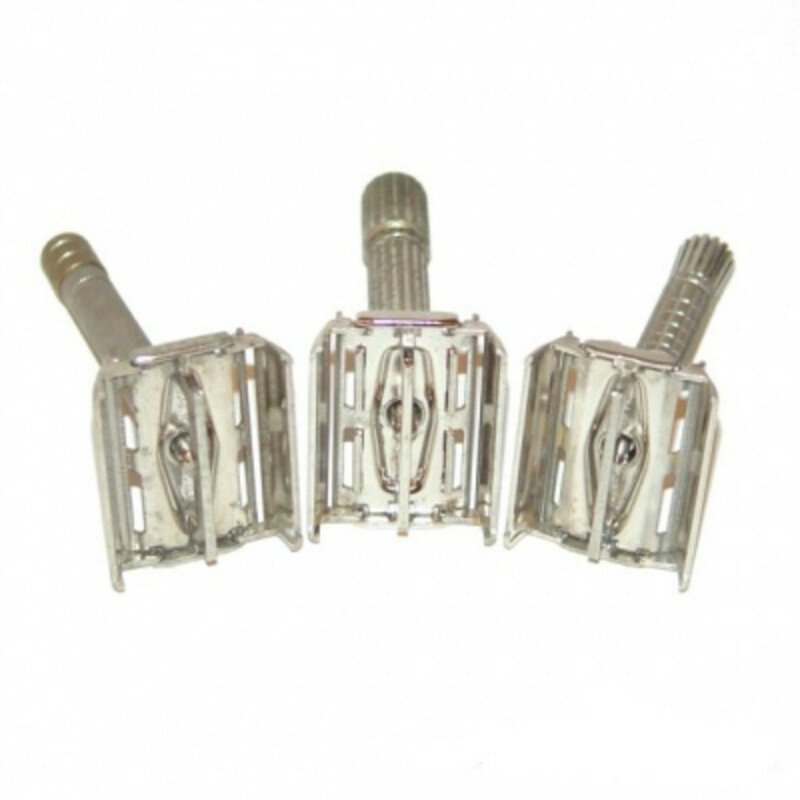 But they will make sturdy daily shavers, and were worth the effort! 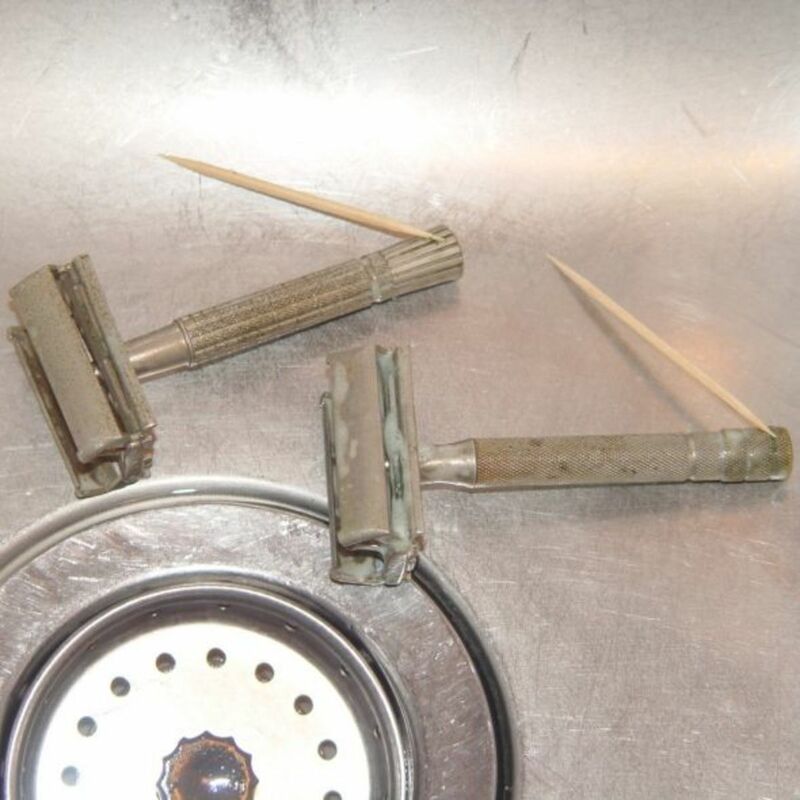 How do you clean your razors? @Brite-Ideas, Collectors will go to any length to shine up their finds! Now that's a procedure! I can honestly say that my boys would buy new ones, but my husband is a bit of fuss-pot and would probably follow this process! Thanks for your efforts here. I had never heard of Evaporust before...I'm going to try to find that locally. It looks like a lot of work, but they look really good when they are done. I wish I could preserve mine and use the techniques of cleaning suggested by you. Lovely lens. That is a very well done article. You might want to repost it on The Shave Den and The Shave Nook forums, where it will get much more visibility than on Squidoo. Thanks you for that very useful information! Good job Valerie. Very informative. 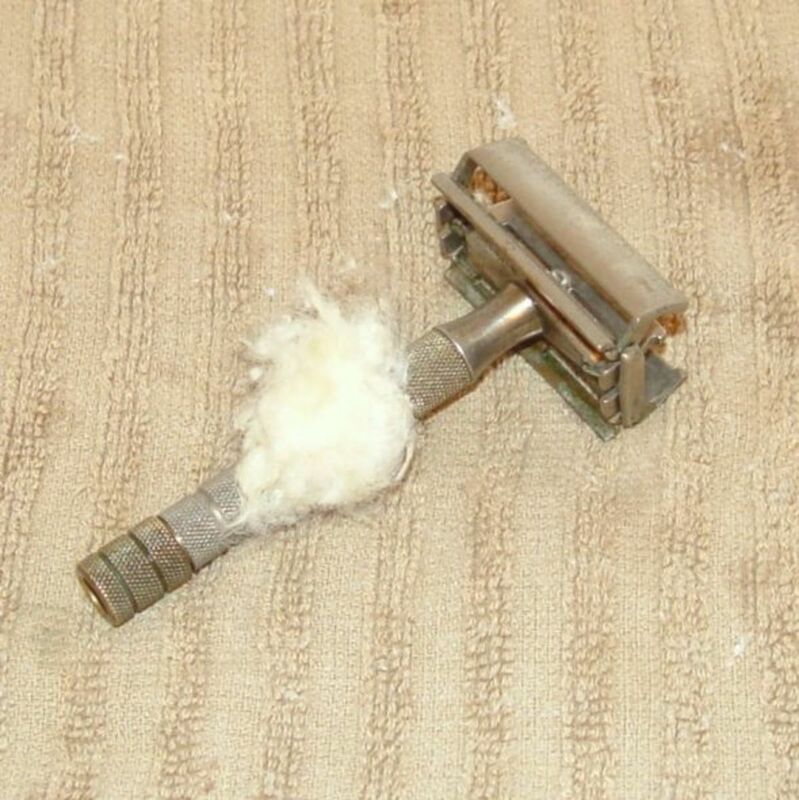 I've learned that most of the time, the ugliest razor will clean up to be almost mint condition. Also, dirty ones are always cheap to buy because the sellers are disgusted by them. @EEWorkouts: Thanks, I'll have to try that! What about oxiclean? I got a heavily corroded strainer looking new with a good long soak. Great lens! @Scarlettohairy: Thank you! It was a long day, taking those pictures! Wow, that's quite a process, but the results are stellar! Great step by step instructions. The photos are great too!